When you buy a mountain bike, your ultimate intention is to ride it through the toughest of roads for which it is built. And if that is the case then it is inevitable to face a lot of obstacles on the track. For starters, it gets a bit tricky and sometimes very much frustrating as the journey gets hindered due to all that. So, today we will talk about the common obstructions that we normally face on such tracks and how we can manage to pass them like a pro and improve your mountain biking skills. One of the most common things that you will face on a mountain road is the rocks. They are everywhere and it bothers most new riders a lot. Not knowing the maneuvers to tackle the rocks, most riders often go off the tracks and hurt themselves real bad. The trick is to absorb the shocks while riding through rocky terrains and be calm. Paddle smoothly and a bit faster than usual so you can go pass through easily. If you go slower, you won’t have the momentum and that will through you to the ground. So, being steady and have the proper speed is the key. The mountain is filled with surprises for riders. You can’t expect it to be like a normal road. Things will appear from anywhere. One moment you are riding on a smooth ground and the next moment you are stuck in a pile of mud. That’s how unforgiving the roads are. And if you encounter a muddy situation the best way is to paddle fast so that you can pass through it like a hot knife through the butter. Don’t slow down or your wheels will certainly get swallowed. Logs are everywhere in mountain areas. If that is blocking your path then you need to hop over the log. This is a skill that might take a bit longer to master. First, you need to put your body weight on the back of the bike and then yank the handlebar up. 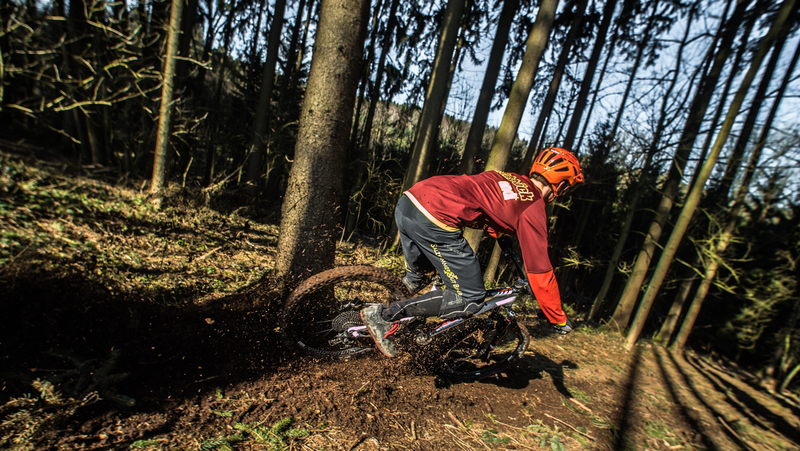 We wrote a guide on body position mistakes which can ruin you mountain biking. Then just paddle smoothly. You will get past the obstruction as you put the front wheel out of the equation. When you are up on the log, don’t forget to put your front body weight in business to make sure your entire bike can pass the obstacle. Momentum is the real key in such cases and also you need to be brave. So, wake up your inner demons to cruise through in such situations. In many hill areas, you will meet the challenge of water streams. Maybe the most difficult thing that you can encounter through a mountain track. Because water flow is unpredictable and so do the surface under it. Riders need to think and the best course of action will be to check the depth of the stream. Also, need to examine the surface because you don’t want to slip and get injured. There are so many things that can put your life in danger. It can be real slippery, holes that you can’t see and even rocks beneath the water. So, check thoroughly and then if you think all is good only then go with it. Paddle at a steady speed and keep your concentration. And the last thing is the leaves. Many will think it as a joke but in most cases, the littlest thing can hurt you the most. Because leaves in such areas are often wet. So, they can be slippery. Just keep your focus level up and you will be ok. I hope this tips will give you some advantage next time when you go on to ride on your mountain bike. Following these will benefit you and so do wearing safety gears like a helmet and other stuff. Because you never know what is waiting for you. So ride safe and have fun.